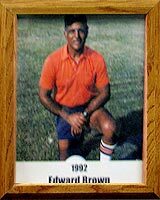 Edward “Ed” Howard Brown graduated from Colorado Springs High School, where he was active in football, wrestling and track. While serving in the Marine Corps Depot in San Diego, he again found the opportunity to play football. Perhaps a twist of fate placed two particular football coaches in Ed’s path. Former coaches at Hardin Simmons University recognized his football abilities and alerted Coach Warren Woodson, who had become Head Coach at Arizona. Ed became a “Wildcat.” To Ed’s delight, Coach Woodson preferred “Two Way” football players, and Ed became a guard on offense and a linebacker on defense… life in the trenches, for sure. Ed, who lettered in football and track (shot & discus) during each of his undergrad years, stayed on campus another year to earn a Masters’ degree. Ed then became a teacher-coach in the Tucson Public School systems. At Pueblo High, where he assisted in coaching both football and track, he met Head Football Coach Lou Farber, a 1990 inductee to the Pima County Sports Hall of Fame. Then, Cholla High School opened in 1969, Ed Brown was named Head Football Coach. When Ed retired in 1988 after 19 seasons of football and 20 seasons in track, he left a record that still lives in the hearts and minds of the young men who played for him.